"The only location that bees are claimed in the Book of Mormon is north of Babel. There are only two verses in the Book of Mormon that contain the word bee or bees. Only one of these two verses state that bees were present, which is in Ether 2:3. This claim is made immediately after a group of people have left the area of the tower of Babel and headed north. Most modern day scholars place the tower of Babel in present day Iraq. This group eventually does get to the Americas, but this is not until Ether 6:12. Between these two verses, the group travels an unknown amount of time to the sea, sits on the shore for 4 years, and then takes almost another year to travel across the sea. These two verses can be found on pages 540 and 549 of the 1st edition of the Book of Mormon. The only difference between versions is a single comma change on page 549. According to archeological discoveries, bees were kept for their honey in Egypt during the Early Dynastic Period, which ranged between 3100 BC and 2700 BC. The first known bee apiary dates to 1000 BC and was found in Israel. While some scholars place the origin of the honey bee in Africa, the honey bee is later known to have been in the Ponto-Caspian area still much earlier than the settlements that eventually became Egypt. The Ponto-Caspian area is the northern steppe between the Caspian Sea and the Black Sea. The other reference to bees in the Book of Mormon is found in 2 Nephi 17:18. This verse is a quotation of another record and discusses the bees in the land of Assyria. This is found on page 93 of the 1st edition of the Book of Mormon. Again the only difference is a single comma." The only location that bees are claimed in the Book of Mormon is north of Babel in the ancient Near East. Ether 1:33 places them at the tower of Babel. "Which Jared came forth with his brother and their families, with some others and their families, from the great tower, at the time the Lord confounded the language of the people, and swore in his wrath that they should be scattered upon all the face of the earth; and according to the word of the Lord the people were scattered." "And it came to pass that Jared and his brother, and their families, and also the friends of Jared and his brother and their families, went down into the valley which was northward, (and the name of the valley was Nimrod, being called after the mighty hunter) with their flocks which they had gathered together, male and female, of every kind." "And they did also carry with them deseret, which, by interpretation, is a honey bee; and thus they did carry with them swarms of bees, and all manner of that which was upon the face of the land, seeds of every kind." "And it came to pass that the Lord commanded them that they should go forth into the wilderness, yea, into that quarter where there never had man been. And it came to pass that the Lord did go before them, and did talk with them as he stood in a cloud, and gave directions whither they should travel." Ether 2:6-7 contains a small summary of their journey that is about to take place. "And now I [Moroni, who is abridging the original record] proceed with my record; for behold, it came to pass that the Lord did bring Jared and his brethren forth even to that great sea which divideth the lands. And as they came to the sea they pitched their tents; and they called the name of the place Moriancumer; and they dwelt in tents, and dwelt in tents upon the seashore for the space of four years." "And thus they were driven forth, three hundred and forty and four days upon the water." "And they did land upon the shore of the promised land. And when they had set their feet upon the shores of the promised land they bowed themselves down upon the face of the land, and did humble themselves before the Lord, and did shed tears of joy before the Lord, because of the multitude of his tender mercies over them." Most scholars believe that the tower of Babel was located near modern day Iraq. This area is geographically referred to as the Near East and is part of South-West Asia. Determining when this group from the book of Ether left Asia can be estimated on the archeological record based on what is known about the tower of Babel. According to the Bible the tower was built using baked bricks, which the archaeological record indicates came into limited use in Mesopotamia after 3500 BC. Ziggurats began showing up in the area of Babylon using baked brick during the reign of Ur-Nammu, who lived around 2100 BC. The Ziggurat of Ur, which was built with baked bricks, is dated to this time. While scholars have also identified later sites that could also match the description of the tower, using the mid to early third millennium (2500-2000 BC) allows us to cover all of those possibilities. The use of bees for honey has been known to exist in Egypt since the Early Dynastic Period which was between 3100 BC and 2700 BC. 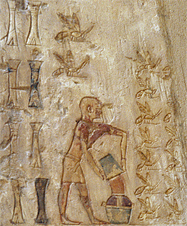 The first Egyptian glyphs of beekeeping appear shortly after this time. The first man made apiary has also been found in the Near East, in Israel. This dates to about 1000 BC. "The western honey bee presumably arose in the Near East or Pontocaspian regions at some point during the early Pliocene. This species subsequently dispersed throughout Africa and Madagascar (entering via the Arabian Peninsula), into Europe, and into Northwestern Asia as far as the Russian Steppes. Localized adaptation gave rise to the numerous subspecies which are recognized today." Most subgenera of bees are thought to have originated in either Asia or Africa. According to some scholars, Apis mellifera (the honey bee) may have originated in Africa and migrated from there. "And it shall come to pass in that day that the Lord shall hiss for the fly that is in the uttermost part of Egypt, and for the bee that is in the land of Assyria." Ether 1:33 - Found on page 539 just beneath the middle of the page. Ether 2:1-3 - Found on page 540 about 3/4th of the way down the page; starting at the last paragraph on that page. Ether 2:5 - Found on page 541; starting with the first sentence on that page. Ether 2:13 - Found on page 541 near the bottom of that page. Ether 6:11-12 - Found on page 549 near the middle of the page. 2 Nephi 17:18 - Found on page 93 just above the middle of the page. Ether 2:6 - Found on page 541 at the top of the page.